Here is a screen shot of the Samsung Victory. 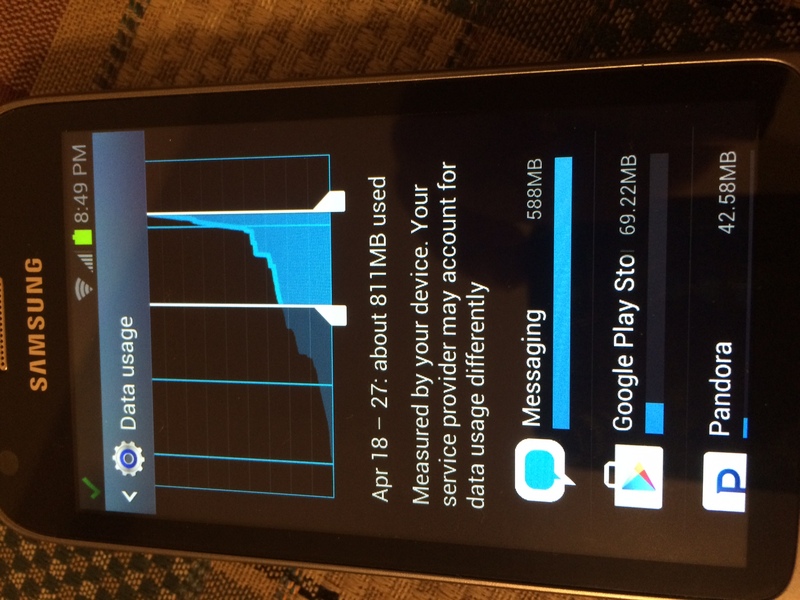 Note it says the Messaging App used close to 600MB in a week. The last 200MB was over the Cell network WHILE plugged in at home connected to Wi-Fi overnight. No messages were sent or received during the night that it used 200MB. Of course this used the entirety of the 500MB of data plan and then some. The messaging app was updated within the past two weeks. Makes me think there is a bug in the latest version of the messaging app. Have powered it off and back on and that does seem to have stopped it for now. Any idea on what can be done to prevent this from happening again? I am less concerned with the fact that my data was used up one time, then if it keeps going and consumes it each month and/or makes my service unusable or cost prohibitive. Dods your data usage in settings match how much data you've used in total? Yes it does for the period compared. I would hate for this to be a software bug in FreedomPop's Messaging app that goes through massive amounts of data on enough customers that casues financial strain on FreedomPop. If it helps, I've been having the same problem. Something on my phone is using about 1MB every hour --- even while in airplane mode with the WiFi turned on. As with Maia, the usage appears to be coming from Messaging. Interestingly enough, about the same time the data usage went up, I started hearing a European-style tone when making calls instead of the more familiar American-style "ring"